The exhibition at the Rihga Royal Hotel finished successfully. Thank you to those who came to see it. All of my students and myself feel relieved. I will upload a few photos from the exhibits. Now I will rush to prepare for a presentation to be held in Boston next month. 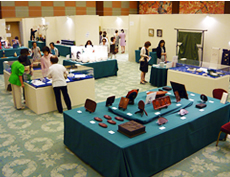 Exhibition at RIHGA Royal Hotel Osaka will be held on July 26 and 27. 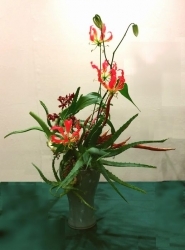 My students and I will exhibit our ikebana works. There are various classes, and all exhibits are from the classes. 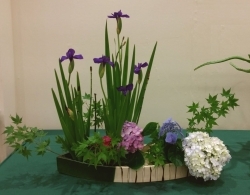 Also I will give a presentation with powerpoint photos on 'Ikebana taught in English' class from 16:00 Tuesday, 26th. No admission fee is required. 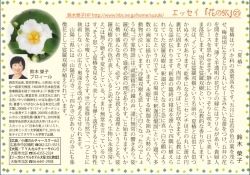 Please come and enjoy Japanese arts. See many of you then!